Is Apple Supply Chain Really the No. 1? Supply Chain Opz: Is Apple Supply Chain Really the No. 1? Is Apple Supply Chain Really the No. 1? Everything about Apple Inc is the talk of the town. For example, the new iPad, iPhone, Apple Map or even the environmental and labor issues at its suppliers' facilities. Surprisingly, IT research firm Gartner ranks Apple Supply Chain as the best supply chain in the world for many years. Without a doubt, Apple Inc is the world leader in Innovation, Branding and Software Ecosystem. But, is Apple's Supply Chain really the number 1? This case will show you the analysis of Apple Supply Chain core processes, challenging issues and complexities of its operations. 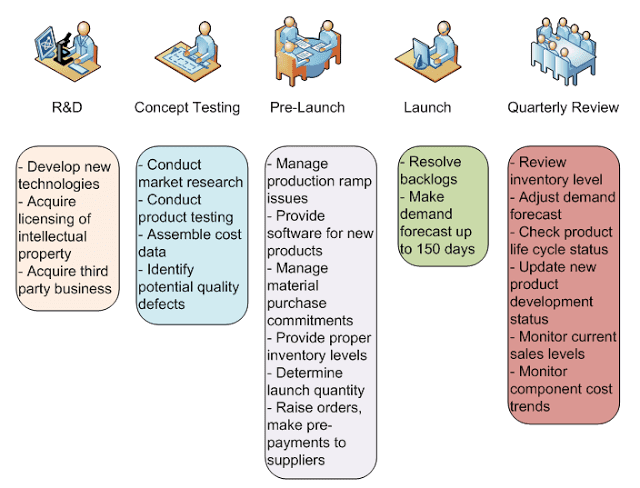 Supply Chain Planning at Apple Inc is the classic example of the New Product Development Process (NPD). It's the integration of R&D, Marketing and various functions under supply chain management. From the above graphic, Apple Inc accelerates the new product introduction by acquiring the licensing and 3rd party businesses. The whole process looks very similar to that of other industries. The interesting point is that Apple Inc has to make the prepayments to some suppliers to secure the strategic raw materials. Supply Chain Map is the way to express a large system from the points of origin to points of consumption in a simple to understand manner. Information from the annual report is also used to produce the Apple Supply Chain Map. Apple Inc purchases raw materials from various sources, then get them shipped to an assembling plant in China. From there, the assembler will ship products directly to consumers (via UPS/FedEx) for those who buy from the Apple's Online Store. For other distribution channels such as retail stores, direct sales, and other distributors, Apple Inc will keep products in Elk Grove, California (where central warehouse and call center are located) and supply products from there. At the end of a product's life, a customer can send products back to the nearest Apple Stores or dedicated recycling facilities. - Global economy could affect the Company. - Some re-sellers may also distribute products from the competing manufacturers. - Inventories can become obsolete or exceed the anticipated demand. - Some components are currently obtained from the single or limited sources. - Some custom components are not common to the rest of the industry. - Ability to obtain components in sufficient quantities is important. - Supply chain disruption such as the natural and man-made disasters can be serious. - The company depends on logistical services provided by outsourcing partners. - The company also relies on its partners to adhere to supplier code of conduct. The above information is also from the annual report. As you can see, most of the risks are on the supply side. 3. How Complex is Apple's Supply Chain? Some people in the blogosphere said that Apple Supply Chain is not that complicated. So this section will explain some characteristics of Apple Supply Chain through various metrics and compare them with Amazon Supply Chain. The above picture shows that the inventory turnover of Amazon and Apple is 10 and 59 respectively (cost of goods sold of digital content/downloadable products is excluded). From the face value, Apple seems to be more efficient. Anyway, there is a reason for this. Apple Inc is now a marketing company with no manufacturing facility, but Amazon is a distributor of general merchandise. It's pretty natural that Amazon has to keep more stocks. Then the inventory turnover is much lower. Supply chain management is about the relationship between trading partners. Working closely with strategic suppliers will bring competitive advantage to the firm. Apple recently said that they have about 156 key vendors across the globe. This amount of suppliers is quite manageable. According to this information, Amazon has about 3 million suppliers in total. Top 5% of this is 300,000 suppliers, way more than that of Apple Inc. In the United States, transportation cost is the biggest portion of the total logistics cost. Then, good management of related function is essential. Apple Inc has the central warehouse in California, but Amazon has approximately 28 warehouses from coast-to-coast. What Apple has to do is to synchronize data between the central warehouse and its own 246 stores + customers. With the appropriate level of the automation, this kind of operations can be done efficiently. For Amazon, the thing is more complicated than that. Amazon is known to employ many Ph.D. graduates in operations research/industrial engineering. The reason is that Amazon's distribution environment must be mathematically solved through the optimization method. Typically, they have to determine how many facilities they should have, where serves which market, items/quantity stored in each location, how to manage transportation between warehouse-to-warehouse and warehouse to customers in order to minimize cost and increase service level. Stock Keeping Unit aka SKU is another indication of supply chain complexity. One model of the phone but different software inside is considered a different item/SKU. According to this, Amazon has about 519 million items in its catalog. About 135 million items are physical products. For Apple, they have about 26,000 items (rough estimate, subject to change). The point is that if you have to make a demand forecast, which one will more difficult for you, 135 million items or 26k items. Put it simple way, the product lifecycle is how long you can sell products (the longer is better). From the rough estimate, Amazon has some seasonal products such as summer wear. They can only sell it for 3 months max. The life of Apple's key products is way more than 12 months. It goes without saying that the demand forecast of seasonal, short life cycle products is very difficult to estimate. 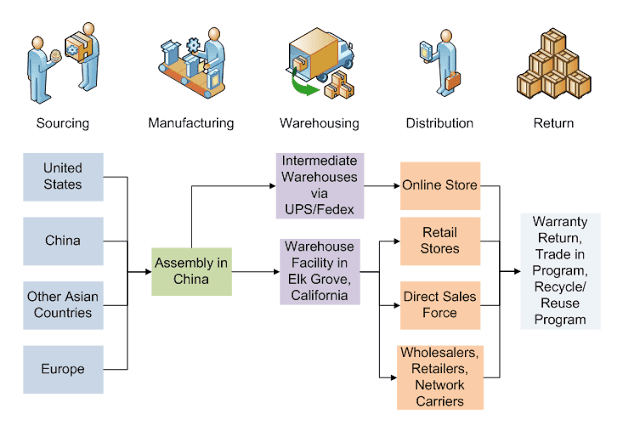 As you may notice, based on the example characteristics, Amazon's Supply Chain is far more complicated than that of Apple Inc. The results of the analysis of Apple's processes, challenging issues, and complexities indicate that the success of its supply chain operations depends on how well they manage the supplier relationship. This includes early supplier involvement in new product development, close communication, and supplier performance improvement/evaluation. Then, Apple Inc is dubbed as "King of Outsourcing." - Kopczak, L. R. (1996). Apple computer’s supplier hubs: A tale of three cities. Stanford University Case.